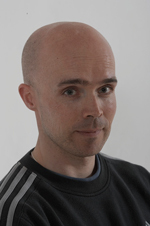 Periodization is a controversial topic within our field and has been since I started training back in 1992. Whether you believe in periodization or not for your athletes, this article will shed some light on the topic. Enjoy! Periodization is not scientifically proven. Periodization is overrated and over studied. Periodization is too rigid and does not work for our athletes. These critique points may be true if your understanding of Periodization is limited to Periodization as a tactic. However, Periodization is fundamentally a strategy. From my personal experience as a strength coach, author, and lecturer over the last 25 years, I have found it incredibly useful – even absolutely necessary – to distinguish between principles, strategies, and tactics in order to really understand a particular topic. Highlight the difference between principles, strategies, and tactics as it applies to Periodization. A “principle” is a basic truth, law or assumption (thefreedictionary.com). A first principle is a basic, foundational, self-evident proposition or assumption that cannot be deduced from any other proposition or assumption. What could be deemed the first principle of athletic development? I recommend that you answer that in detail for yourself in a way that resonates with your work. Optimal development of bio-motor abilities (physical qualities) to support the ability to practice and compete (the specific sport/s) – with maximal quality – at the desired level, at a given age. What does optimal mean? It is the balance of all involved abilities that support the young athlete’s ability to practice and compete. Supporting the ability to practice and compete with maximal quality implies prevention of injury and the nourishment of motivation, joy and confidence. Thus, the 1st Principle defines the overall objective of our work as coaches. How are we going to achieve this objective? Figure 1: The overarching task is defining the 1st Principle. The strategy is chosen to achieve the 1st Principle. Tactics are used to execute the strategy. If you do a web search with the word periodization, you will find books on sports training, history and geology. Thus, “periodization” is a word similar to “categorization” (dividing items – for example, apples divided into categories) or classification (for example dividing athletes into age groups, levels or weight classes). From the definition of periodization as a ‘division into periods” it becomes clear that, fundamentally, periodization is a strategy for organizing long-term training by dividing the training into shorter periods. Clearly, there are more decisions to be made before we have a finished program. These more detailed decisions are the “tactics.” The strategy can be executed with different tactics. Tactics are plans, tasks, or procedures that can be carried out. Tactics may be part of a larger strategy. So far, Linear Periodization, Reverse Linear Periodization, Undulating Periodization, and Block Periodization are the only systems that have been researched in controlled studies. 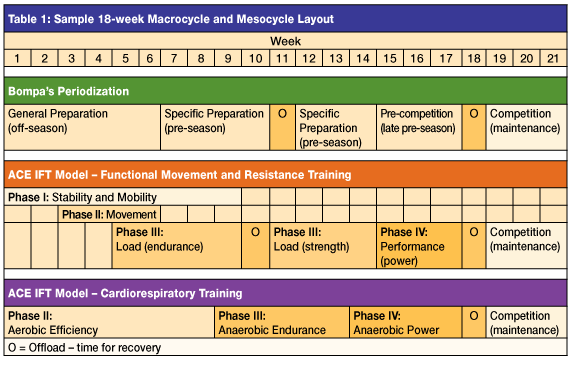 These systems are all periodization tactics. I have never seen a critique of periodization as a strategy. When I have seen a critique of periodization, the critique has been of a particular periodization tactic. As a trainer, you can look at any one of those systems and decide whether or not they are not ideal tactics for the athletes that you work. However, once you make that choice, you still have to decide how are you going to organize your long-term training? 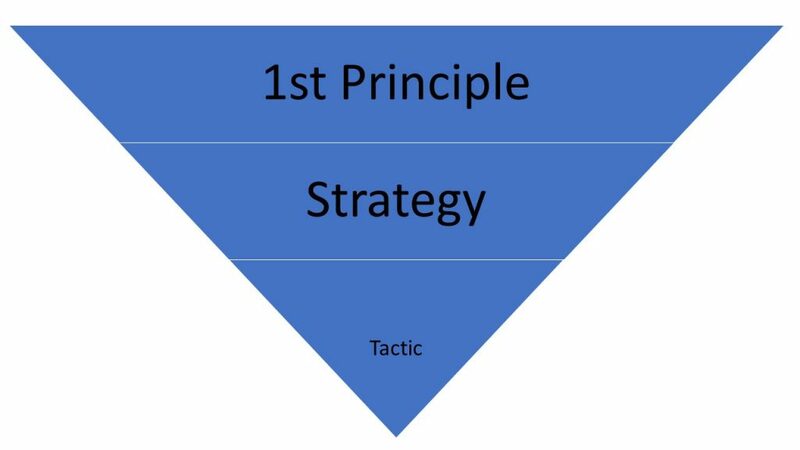 This article described a hierarchy of 1st principles, strategy, and tactics. It made the argument that periodization is fundamentally a strategy. Yet, the critique of periodization is typically centered on tactics rather than principles or strategies. A “next step” in exploring periodization is the question about how to divide the long-term period into shorter periods as well as a deeper look into the characteristics of the mentioned periodization systems. More to come…. This entry was posted in Fitness and Performance, Sports Performance Training, Strength and Conditioning, Youth Athletic Training and tagged Athletic Development, IYCA, K2 Performance Training, Karsten Jensen, Periodization, Sports Performance Training, Summit NJ, Youth Training. Speed is directly correlated to your body ability to generate force into the ground. The stronger you are, the more force you can generate and the faster you will go. You can teach mechanics and running drills all day long, but you can not make a weak athlete fast without making them strong. Though the article below by Todd Durkin focuses on strength for the experienced athlete, basic functional athletic strength training can start at any age. When an athletes presents themselves as slow, it usually means there core (abs, hips, glutes, etc.) is weak, therefore they do not have the ability to run faster. Though this is only one piece if the puzzle, it is important to understand that the body sprint faster…than its ability to stop. The name for this occurrence is “Injury”! Improving speed should be a goal for every athlete. No matter what sport you play, being faster than your opponent can be the difference between winning and losing a championship. With that in mind, I’ve assembled a list of the 10 best speed exercises that will leave your rivals in the dust. Although these are the best exercises for improving speed, they should not be the only exercises that you do. Be sure to have a total-body strength and conditioning program in place, as well as proper nutrition and recovery protocols, to maximize your results. To be fast, you need to be powerful. A good way to build power is by training the Power Clean (or any Olympic lift variation). If you cannot perform a clean correctly, replace it with a Clean Pull. A Clean Pull is a clean performed without catapulting the bar onto the shoulders (think Explosive Deadlift). The Squat is one of the best exercises no matter what your goal is in the gym, so it’s an obvious pick for being one of the best for improving speed. There are many squat variations that are excellent choices. We will focus on the Barbell Back Squat. Squat until your thighs are parallel (or slightly below parallel) to the ground or slightly below parallel. Like the Squat, the Deadlift is a clear choice for this list because it increases the amount of force you can put into the ground. With your feet about hip-width apart, grasp the barbell with an overhand or over/under grip outside your knees. Keep your chest up and back straight as you pull the bar off the floor by fully extending your hips. Keep the bar close to your body throughout the lift. Incorporating sled work into your program is a great way to build strength and speed for sprinting. It’s especially valuable for accelerations because of the forward body angle. I recommend doing both heavy Sled Pushes and lighter Sled Sprints. For a heavy push, load a sled with a weight that’s challenging to push for 10 to 20 yards. Push the sled forward, keeping your elbows straight and your back flat. For sled sprints, lighten the load to a weight that will allow you to sprint with the sled for 10-20 yards. You can even pair both exercises in a contrast set. Many athletic movements take place on one leg, including sprinting, so it’s a good idea to utilize single-leg exercises in your training. There are a ton of single-leg exercises to choose from, but my particular favorite is the Rear-Foot-Elevated Split Squat. The Single-Leg RDL is another great single-leg movement, but it focuses on your hamstrings and glutes, or your “go” muscles. Hold two dumbbells in front of you, and balance on one leg. Slightly bend the knee of the balancing leg and begin to push your hips back toward the wall behind you. Be sure to maintain a flat back position as the dumbbells reach knee/shin level. Extend your hips to go back to the starting position. No list of the best exercises for improving speed would be complete without some plyometrics. This move teaches your muscles to contract explosively, an essential trait of speed. Set yourself up with feet hip-width apart. Perform a quick counter movement by pushing your hips back to the wall. Quickly extend your hips, knees and ankles to jump forward for distance. Land softly in a squat position. Single-Leg Hurdle Jumps train quick single-leg movements and deceleration, important for multi-directional speed and quickness. Standing on one leg, perform a quick counter squat and immediately extend your knee and hip to jump over the hurdle. Land as softly as possible on the same leg. Both the Broad Jump and Single-Leg Hurdle Jumps can be done by going into the next jump immediately after you land or by pausing yourself in between. This is one of the best exercises to increase explosive power needed to sprint. Stand on top of a bench or plyo box. Step off the edge and immediately jump as you touch the ground. The jump performed as you land can be a vertical jump or a broad jump. Use a small to medium size box/bench to minimize the force that is absorbed when landing. Sprinting takes a tremendous amount of core stability, so it makes sense to involve core stability exercises in your training. Set up the cable handle at chest level. Take a few steps away from the machine to unrack the weight. Press the handle away from your chest and hold it at arm’s length. Pause for 3-5 seconds as you squeeze your abs to stabilize your torso. Return the handle to your chest and repeat. Complete the exercise on both sides. This entry was posted in Fitness and Performance, Sports Performance Training, Strength and Conditioning, Youth Athletic Training, Youth Performance Training and tagged K2 Strength and Conditioning, Speed Training, strength training, Summit, Summit NJ, Youth Training.